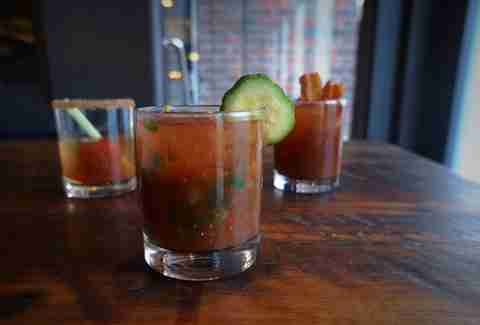 Leave it to Tim Maslow and his crew to make one of the most unique Bloodys in the city. Using a farro bonji, Ribelle utilizes a little fermentation magic to impart a bit of flavor to the classic. Akin to soy sauce, the bonji flavor adds depth and makes this rendition a must-try, particularly if you're a miso fan. Or just like saying "bonji". Their house version is exactly what you'd expect from a Bloody and more; not too heavy on the black pepper or horseradish, and just enough Old Bay -- not to mention a little bit of Irish stout. They don't go too nuts with the garnish here: olive, lemon, and lime. But if you do want to go nuts, there's The Mezcal Mary with a serrano-infused Del Maguey base and a fat pineapple wedge to cut through that heat. Why settle for just one when you can enjoy a perfectly socially acceptable three? Here comes... Mary and a 3-Way. 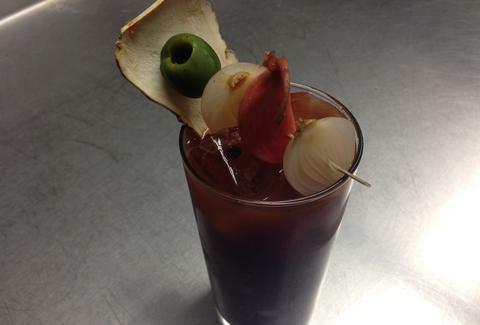 Local hickory and spiced vodka with a Bloody Mary ice cube and celery stick swizzle. 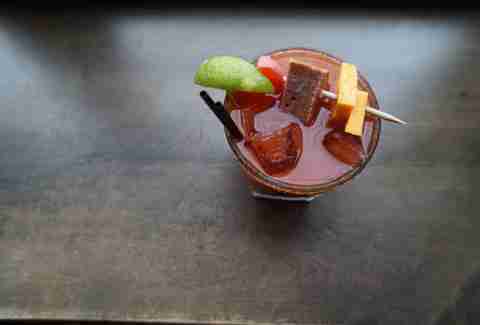 Bacon-infused mezcal (! ), tomato, and amaro. Crushed cucumber, vodka, and cilantro. Feel free to pass them around and share. Or not. Eastern Standard's rendition is pretty… standard, but that doesn't mean it isn't flawlessly executed and delicious -- the gold standard, one might say, if one were continuing to dabble in wordplay. A little spicy, a little citrusy, and a whole lot of classy. 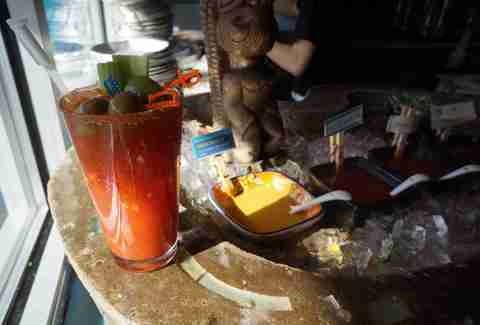 This is the most elaborate do-it-yourself Bloody bar in the city -- choose between vodka and tequila and go nuts. 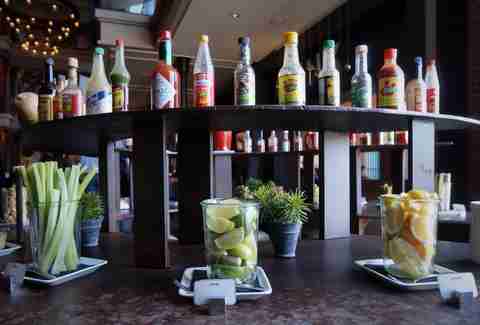 There's a rainbow of hot sauces from mild to wild, all sorts of pickled veggies, and a boatload of spices, all at your disposal in your quest to realize your Bloody destiny. Or, talk a friend into doing it for you because you're lazy. 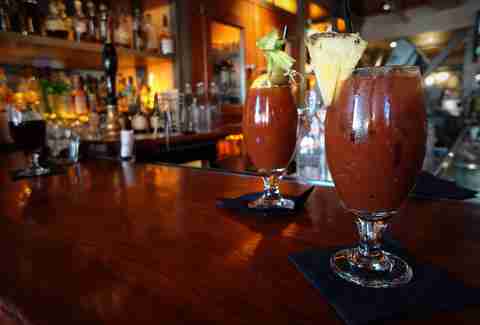 Fittingly celebrated for being one of the city's only seven-day brunch spots, Lone Star's ready and waiting with Bloody Marias every day until 4pm -- spicy tomato juice, house-infused tequila, and just enough pepper. Get it Dallas style for just a dollar more and add a stacked skewer of house-smoked sausage, pickles, and cheese. Last night must have been nuts… how DID you end up waking up in The Liberty Hotel this morning? Well, don't let yourself leave without a proper breakfast. Clink. 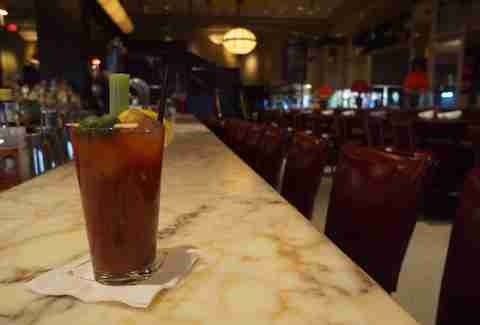 has a standout build-your-own Bloody bar complete with every kind of hot sauce and garnish you could fathom, and even a variety of different house-made bases.